View towards the site of The Reservoir from the north east. The bank is disclosed by the slight break in slope marked by a line of trees. The first depiction of The Reservoir is on Rocque's 1735 Map, suggesting that it was planned alongside the other water bodies in Wanstead Park in the early 18th century. There it is depicted as being broadly rectangular in shape, with slightly curved north-eastern and south-eastern corners, and two small rectangular islands. However, all later maps are consistent in depicting The Reservoir, as actually constructed, with a slightly less regular shape, and with no islands in it. A long-established road or path is depicted as being carried on a causeway along the Reservoir's western side, separating it from the Great Lake. This road was upgraded by Hon. William Long-Wellesley after 1816 and is now known as Blake Hall Road. Another embankment separated The Reservoir from the Lake Pond to the east. Humphry Repton's 'Plans for the Improvement of the Grounds at Wanstead House, Essex, a Seat of W. Long Wellesley Esqr', dated 1813, contains images of The Reservoir, before and after his proposed changes to the planting and fences. It may be that Repton's optimistic assumptions about the water supply were regarded as unrealisable, and The Reservoir was drained around 1819, with all later maps showing it as a wood. Of the original area of the Reservoir, about a quarter has been built over, perhaps a half remains as woodland within the public park, and the remainder has been cleared of trees and is part of the golf course. 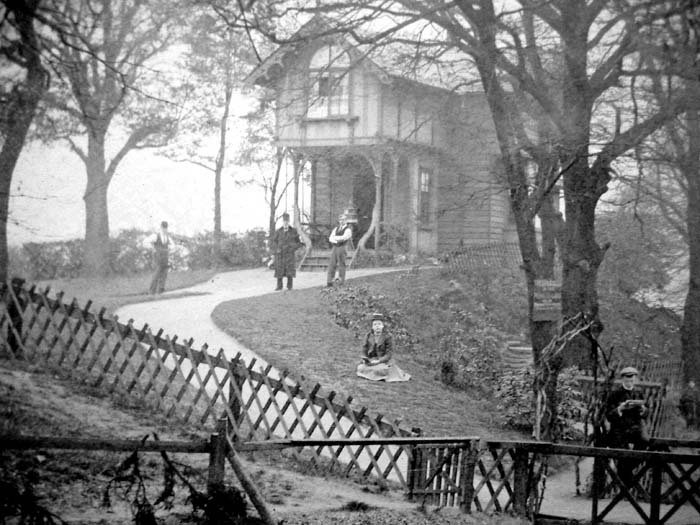 The Swiss Cottge, a Victorian building which was erected on the ornamental mount at the northern end of the Great Lake. Both were destroyed in the 1960s. The Great Lake was a very large water body, one of those created between about 1715 and 1740 to provide vistas from Richard Child's great new Palladian Wanstead House. It occupied almost exactly the same area as the present Lake House estate. On an island or peninsula in the lake was a banqueting house, which later became known as Lake House. This was positioned to act as an "eye-catcher" at the end of the major avenue heading south-west from the house. Lake House survived the demolition of Wanstead House in 1823, and was subsequently let to tenants, including Thomas Hood. Reportedly rat-infested and in poor condition, it was demolished in 1908, having latterly served as a sports pavilion. 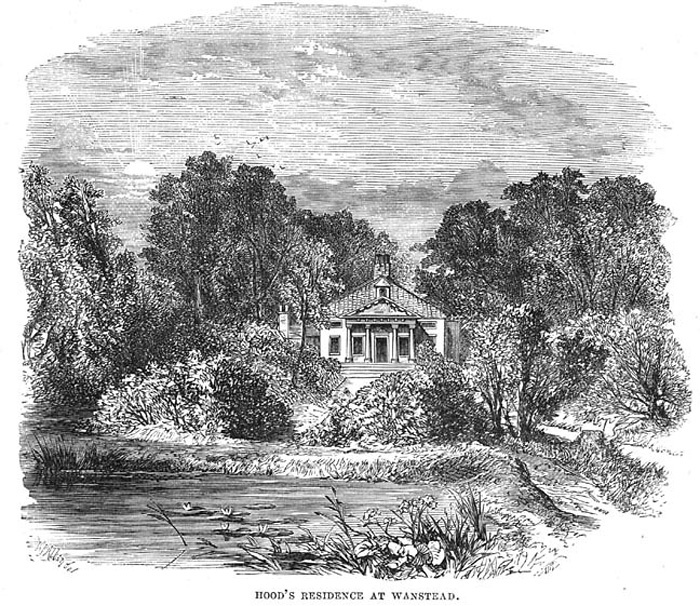 An old engraving of Lake House which, as the caption states, was for several years the home of the writer Thomas Hood. There were several islands in the Great Lake, linked by bridges, and a large ornamental mount at the northern end surrounded by a canal. This survived, surmounted by a pretty timber-framed Victorian cottage, until it was destroyed in the 1960s to make way for a block of police flats, now in private ownership and known as Belgrave Heights. The Great Lake was one of the nineteenth century casualties among the major water bodies associated with Wanstead House, at which time most of it was abandoned and turned over to grazing. The lake was reputedly very shallow over most of its area, though there was a deeper area to the east, which now contains tennis courts. This appears to have once been part of the valley which contains the Serpentine Lakes, but was severed from it by the causeway carrying Blake Hall Road. The road follows an old right of way, but is known to have been greatly improved in 1816. It is possible that the causeway could have been augmented and levelled up at that point, though it may initially have been built as a dam. The serpentine lakes are to the viewer's left. The precise sequence of work in the construction of the serpentine lakes is not known. Cradock’s Map of 1725 is uninformative: it depicts the Ornamental Water as complete, but does not stretch far enough to the west to encompass the area of the serpentine lakes. In the absence of other information, we cannot tell whether work on them had commenced by that date. All we can say is that the configuration shown in Jean Rocque’s plan of a decade later (1735) bears only a limited relationship to the design shown on his plan of 1745, while the latter is recognisably similar to the configuration which exists now. We can accordingly deduce that the layout of the serpentine lakes was finalised at some point between those two dates. 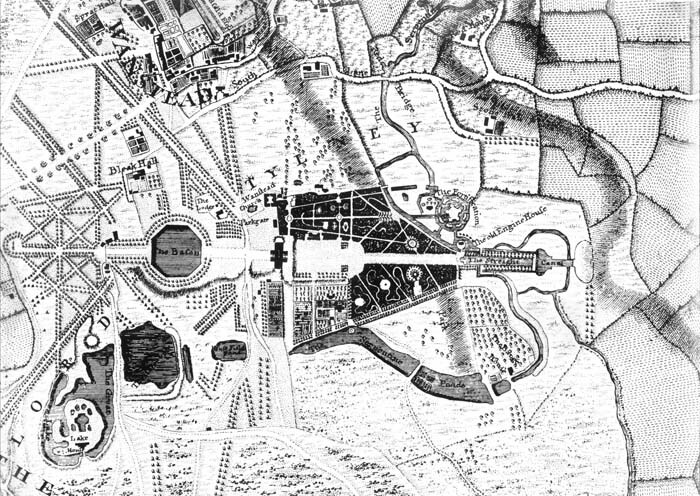 Jean Rocque's plan of Wanstead Park from 1735. Lord Tylney's grandiose intentions for extending the house, lakes and gardens were never to be realised. Jean Rocque's depiction of Wanstead Park in his 1745 "Environs of London" map. The central part of the gardens is accurately surveyed, but the serpentine lakes are sketched in very carelessly. However, it can be seen that they resemble all later plans, so presumably reflect what actually existed by that time. The serpentine lakes made use of the valley occupied by the nameless stream depicted on Norden’s 1594 map. The extent of this valley is now difficult to reconstruct. At the eastern end, it was clearly a significant feature, as may be seen from the profile of the former Square Pond (now The Dell) which, inside the two dams which define it to the east and west, probably more or less discloses the original ground surface. The Dell is almost ravine-like and clearly mainly natural, though the edges were trimmed to produce the Square Pond's shape. Neighbouring areas of the Perch Pond are said to reach a depth in excess of 10-15 feet and may be assumed to have a similar profile. The depth of the valley in this area suggests that it was unlikely to have been formed by spring action in present climatic conditions, even if a spring-fed stream appears later to have occupied it. Perhaps, like some of the fossilised landforms in Epping Forest, it was the product of torrential seasonal run-off in periglacial or tundra conditions at the end of the last Ice Age. The difficulty met him [Lord Tylney] at the place where the house should be built, that there was no water; but money could cure all such things. Where, previous to that time there was scarcely anything but a ditch with a little water in it, we now saw a large flowing river, all made with art and human labour. By the early years of the nineteenth century, the problem of supplying water to the lake system seems to have led to a drastic rationalisation, with a number of lakes being abandoned. The Square Pond was drained by 1815, the Reservoir around 1819, the Great Lake was mostly abandoned by the 1820s and the Lake Pond between 1841 and 1850. All of the lakes are bounded by dams or embankments, still present as substantial earthworks - on the southern side of the Basin; around the eastern side of Reservoir Wood; between the Shoulder of Mutton Pond and Heronry Pond; as a raised path between the Perch Pond and former Square Pond; and between the Square Pond and Ornamental Waters. Culverts and channels were designed to allow water to flow between successive ponds in the chain. 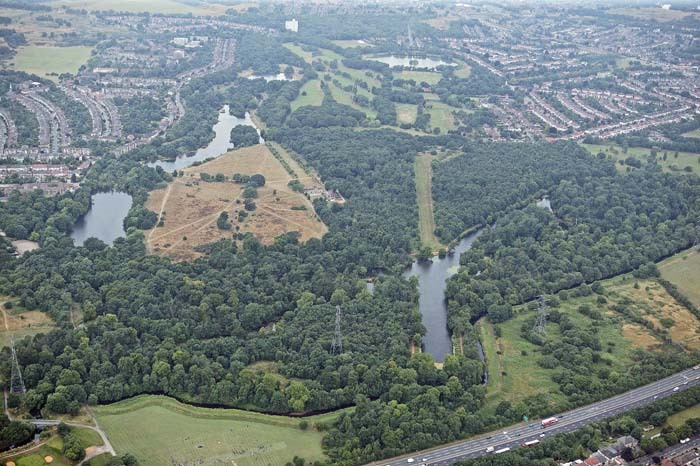 Aerial view of Wanstead Park from south of east. 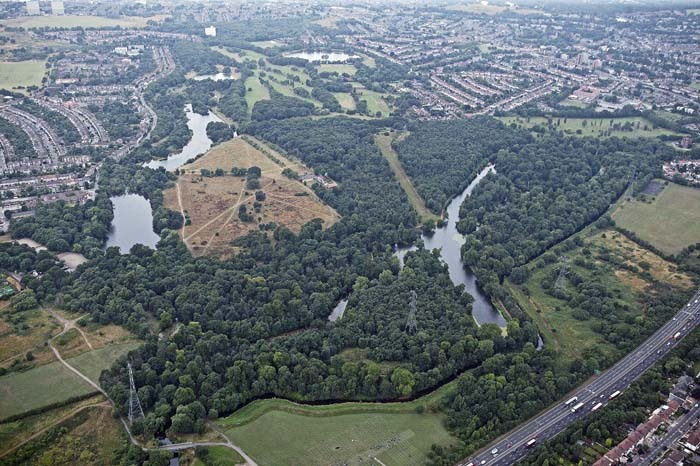 The lake system in Wanstead Park divides into two parts, each exploiting pre-existing natural features. The River Roding runs along the eastern boundary of Wanstead Park. In the early eighteenth century, its water levels were raised by weirs, and its course elaborated into a system of interlinked channels which became known as the Ornamental water. The river was canalised to its present course in the third quarter of the eighteenth century, and severed from the Ornamental Water altogether in the early nineteenth century. To the west and south of the park, a cascading chain of lakes was created which partly utilised a natural valley running from west to east, though this was undoubtedly much enlarged. Norden’s 1594 Map of Essex depicts a tributary running into Wanstead Park from the River Roding. This natural stream, which Smart Lethieullier described as “a well of exceeding fine water”, was probably one of the main factors which had earlier attracted prehistoric and Roman settlement in the area which is now known as The Plain. A number of water features pre-date the existing lake system, and have been adapted and incorporated into it. The most securely dated is The Basin, which was adapted in the early eighteenth century from a pair of fish-ponds commissioned by Sir Josiah Child some time before 1691. It appears to be fed by groundwater or springs. Three additional features are all depicted on Jan Kip’s view to the east dating from around 1715. The first was the Garden Canal, which was filled in after 1715. The other two - the Straight Canal, and an additional unnamed canal – were subsequently incorporated into the Ornamental Water. All three may well date from the first phase of the landscaping works commissioned by Sir Richard Child (later Viscount Castlemaine and Earl Tylney of Castlemaine) between 1699 and 1715. However, they could equally date from his father’s time or even earlier. It was Sir Richard Child who was responsible for the defining moment in the history of the lake system of Wanstead Park. 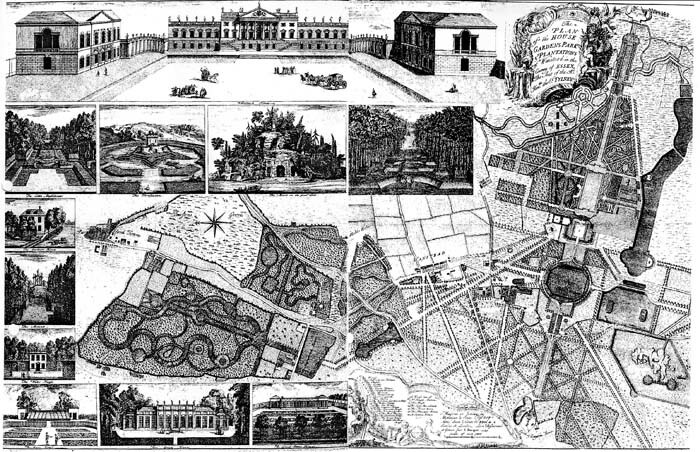 In tandem with the rebuilding of Wanstead House after 1715, he commissioned a second phase of landscaping work, which involved the creation of a series of vast new water bodies on three sides of the park, the surviving elements of which give today's park its unique character. Wanstead Park’s lake system at its greatest extent, around 1800. The lakes are overlaid on LiDAR and Ordnance Survey images of the present-day landscape to assist orientation. The orange line represents the boundary of the Grade II* listed park, while the yellow dashed lines represent current divisions in ownership. Key: (1) The Basin, (2) The Great Lake, (3) The Reservoir, (4) The Lake Pond, (5) The Shoulder of Mutton Pond, (6) The Heronry Pond, (7) The Perch Pond, (8) The Square Pond, (9) The Ornamental Water. Lidar imagery © the Environment Agency, Ordnance Survey imagery UKMap © The GeoInformation Group 2013. The lakes in 2013. Four major water bodies have been abandoned since 1800, while the Heronry Pond has been reconfigured and reduced in size. Lidar imagery © the Environment Agency, Ordnance Survey imagery UKMap © The GeoInformation Group 2013. The most important surviving features of Wanstead Park’s eighteenth century landscape are its lakes. Extensive though they are – totalling some 43 acres in size – they are merely the remnant of a waterscape which was once considerably larger. Of the nine significant water bodies created between 1715 and 1745, only five now survive: The Basin; Shoulder of Mutton Pond; Heronry Pond; Perch Pond; and the Ornamental Water. The others - the Great Lake, the Reservoir, the Lake Pond, and the Square Pond – were all abandoned in the first half of the nineteenth century. The reasons for this are not explicitly documented, but clues on maps from the period suggest it was a result of the perennial problems with inadequate inflow and leakage which will be referred to in the articles in this series. The lack of a resident owner at Wanstead House between about 1764 and 1812 may also have resulted in a lack of maintenance of the system which was later judged too difficult or expensive to reverse. Our purpose here is briefly to discuss the origin of the lakes, and to outline something of their subsequent history. Current issues relating to their maintenance and restoration will be dealt with elsewhere on this site. 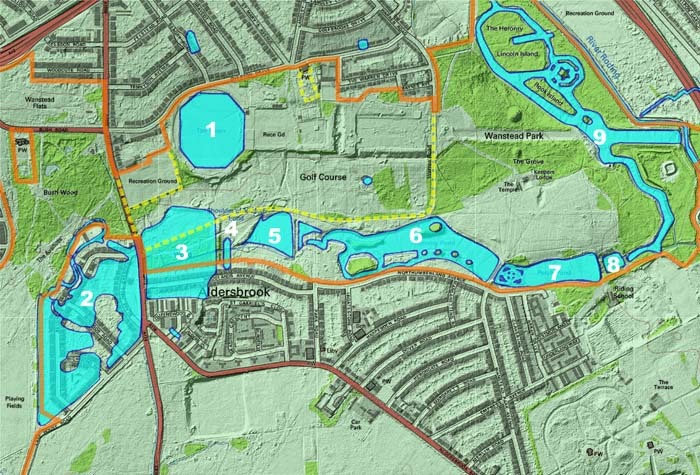 The articles have drawn heavily on texts which formed part of the 2013 Strategic Assessment and Conservation Measures for Wanstead Park. 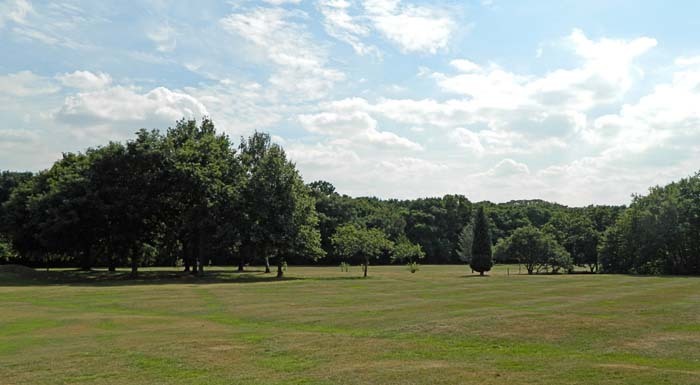 This project, which is intended to feed into a future Conservation Management Plan for the park, was commissioned by English Heritage and carried out by Compass Archaeology, with extensive contributions by the Friends of Wanstead Parklands. In this report, originally published in March 1978, the authors explain discuss the history of the lake system in the park and explain why the water levels are still prone to wide fluctuation. Click here to see a full version in a pdf file.